One of the most delicious and beloved by many Russians dishes is the fried mushrooms, which before roasting process in the following ways: drying, freezing, salting or pickling. It is believed that mushrooms is better not to cook because they have already been heat treated and consumed in the form of cold snacks. However, there are many recipes for pickled mushrooms frying, the result is a delicious dish even better than fresh fried mushrooms. Any marinated mushrooms (mushrooms, white chanterelles, russules, mushrooms, etc.) before roasting, thoroughly rinse in running water. You can use it as a home mushrooms marinating and the store. Heat a pan on the stove and add a few tablespoons of vegetable oil. Onions cleaned, cut into cubes or half rings and fry on medium heat until Golden brown. Then put in a pan the washed mushrooms, salt and add spices to taste, close the lid and cook for 15-20 minutes. For a few minutes before roasting can add sour cream to the mushrooms. Grilled marinated mushrooms is ready and can be served with vegetables (cabbage or potatoes), buckwheat or other side dishes. Prepare fried mushrooms with potatoes. Peel the onions and shred, then saute in vegetable oil in a pan. Rinse mushrooms and place in a separate plate. Potatoes clean and cut into strips, season with salt and fry with onions until soft. Then put in a pan the mushrooms and fry on low heat. 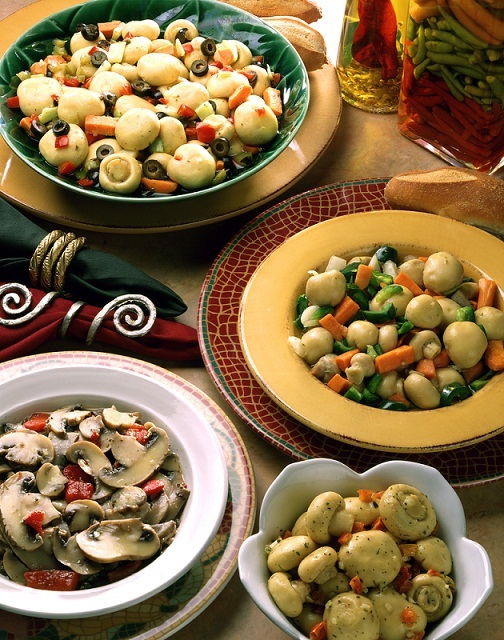 Keep in mind that cooking the potatoes and mushrooms should be gently, be careful that the potatoes are almost cooked, and only then add the mushrooms, and the dish may turn out tough. Undoubtedly, your family will enjoy grilled marinated mushrooms with sour cream. The mushrooms thoroughly under running water and place in a separate plate. Meanwhile, peel the onion and fry in a pan with hot oil, then put to the onions mushrooms and fry for a few minutes, then add vegetable oil and continue to cook until the liquid evaporates. In the next stage, add the mushrooms sour cream, salt and pepper according to your taste. Once the cream starts to boil, cover skillet, and simmer on low heat for about 5-7 minutes. If you want to Ugarit sauce, the extinguishing time should be increased. A few cloves of garlic peel and crush them with chesnokodavilku. Finely chop the herbs (parsley, dill, green onions, etc.). For a couple of minutes before turning off the pan add the mushrooms and the sauce of garlic and herbs which give the dish a spicy flavor and aroma. So you've made the grilled marinated mushrooms in cream sauce, which serve with buckwheat, potatoes, cabbage or lettuce. In that case, if your mushrooms are stored for a long time, and they have an unpleasant smell, then add fried mushrooms, a few cloves of garlic, which will give a pleasant aroma. Pickling can be any tubular mushrooms – mushrooms, white mushrooms, chanterelles, boletus, aspen, and the most tasty young mushrooms with small caps. The first mushrooms should be thoroughly cleaned of debris and rinsed several times in cold water. Before you marinate the mushrooms, they must be boiled. To do this, simply boil them for twenty minutes. While cooking the mushrooms to stir and to remove the resulting foam. At the end of cooking add a little vinegar and a tablespoon of salt. 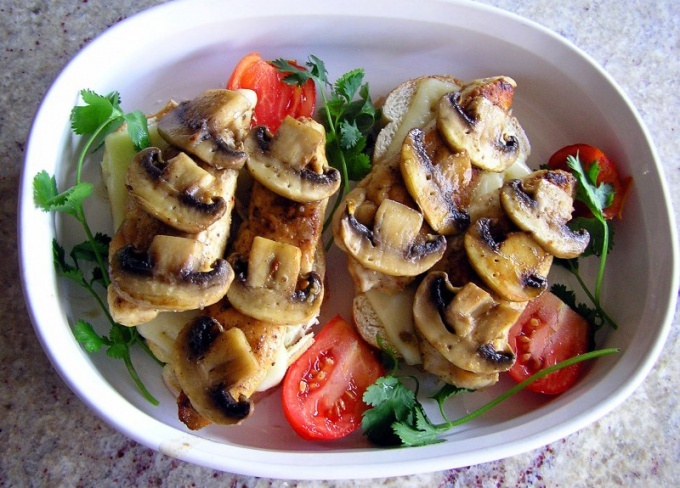 Vinegar is needed to return to the mushrooms light color, because during cooking they darken. Then the mushrooms should be washed under running water. In a separate bowl make the marinade. In one liter of cold water dissolve one tablespoon sugar, two tablespoons salt, vinegar to taste. To prepare marinated mushrooms, brine should be two times larger than the amount of available mushrooms. Pour brine cooked mushrooms. Now is the time to take care of banks and caps. Banks, the best half-liter, you need to thoroughly wash and sterilize, cover pour boiling water. To dry cans to put one Bay leaf, umbrella dill, two or three peppercorns. The mushrooms in the jars, you need to put together with brine – they must not adhere to each other, to swim in the marinade, otherwise, do not avoid the process of decay. Filled jars, cover with lids, put them in a deep pot, put at the bottom of the cloth, and pour water up to the shoulders. Bring the water to a boil and simmer for fifteen minutes on very low heat. Then caps need to tighten, and to put the banks under the blanket upside down until cool. Store the jars with the mushrooms better in a cool dark place. This way you can marinate mushrooms, even store-bought frozen – oyster, mushrooms. Get no less delicious.